In this video, I talk about the importance of giving yourself some self-love. When you take the time to do things that are just for you, things that bring down your stress levels, make you feel peaceful, happy and joyful, you are so much better to those around you. 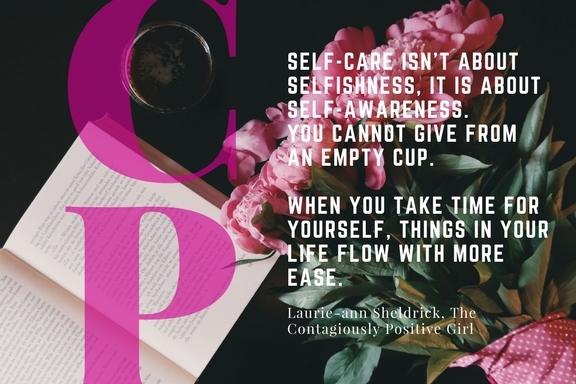 A major part of being Contagiously Positive is self-care. Sadly, so many women just don’t take the time for it. Everything and everyone is more important than themselves. Sound familiar? I learned very early on that if I was going to perform at my highest potential, I had to take care of me first. I’m not talking about putting everything and everyone else aside and spending days or hours on just me. I’m talking about 30 minutes of scheduled me-time. When I was in college, I had a fulltime bartending job, on top of my fulltime class schedule. It was the only way I could afford to go to college, so I couldn’t budge on the hours. Some days started at 8:00am and didn’t end until 2:00am when the bar closed. No matter what time I would get home, I would run a bath and soak in the tub for 15 minutes. That routine did many things. It helped me unwind after a long day, so I could sleep better. It helped me relieve stress. It was great for my feet, which took a beating from being on my feet for 8 hours, and it gave me time to think of nothing else but myself. It sounds so simple, but for me it was the most important thing I could do for myself and for my sanity. 15 minutes of alone time can feel like an eternity. Anyone who experiences never ending days will know exactly what I mean. Even after graduating and leaving my bartending gig, I continued my self-care bath ritual. It isn’t a daily routine anymore, but when I need me-time, and we all need some of that once in awhile, a bath is my go-to stress reliever. I remember when my husband and I were shopping for our 1st home. On the top of my list of must-haves was a good bathtub. We walked into one home that had this amazing tub. I was sold! I didn’t care that the entire house was painted in pastels, or had baby blue carpets. What I saw was my personal stress reliever in shiny white. It even had jets! We bought that house and I enjoyed many hours in that tub. I know that you are all so busy, but the one thing I know for sure is that you need to make time for yourself. It is critical for your health. I know what you are thinking, “I have no time for me time.” You have to make the time. The end of the night, just before bed, is the best time. If you have kids, wait until they are in bed so you can fully commit to yourself.